43 Responses to In a Vase on Monday. Fanny. Aside from the gorgeous flowers, your assessment of Fanny (the character) is spot on. Thanks for the giggle and the lovely blooms. Perhaps I am a bit hard on poor Fanny, she is very worthy. But I haven’t much time for people who have no sense of humour. Jane Austen had a highly developed sense of humour and in her letters she could be quite naughty so I don’t quite see why she wanted us to admire boring Fanny. Fanny is certainly one of Jane Austin’s least lovable characters, but Fanny the snowdrop is lovely. I very much like how you displayed her in the basket. I sometimes despair about photographing my vases. I think those who attach success almost always have some kind of backdrop organised. 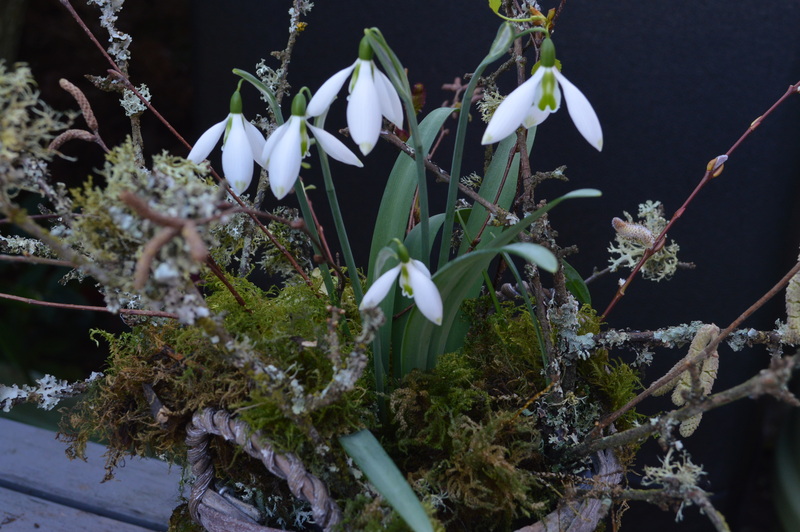 Have you ever picked the seedpods from the snowdrop to sow in pots? I’d like to think I might be successful if I sowed them into pots ready to plant out when they are large enough. Getting the light right is a problem and then you have to consider the backdrop. Outside was a bit too breezy today but after all this is a blog, not a glossy magazine. I don’t bother sowing the seeds , the snowdrops seem quite capable of managing it themselves. I could give you some bulbs when I see you if you want some more.. Your snowdrops are beautiful. I didn’t like Fanny Price much either, until I realised that for all her less attractive traits which you mentioned above, she does stick to her guns about not being forced into a marriage she feels is wrong for her. She has been pushed into things all her life, but, for once, she stands up to Sir Thomas, even though she is punished for her decision. I admire that in her. You are right we have to give her that. But her cast -iron self righteousness is very irritating. Mary Crawford is quite kind to her but her for all her apparent humility she is is very much aware of her moral superiority. 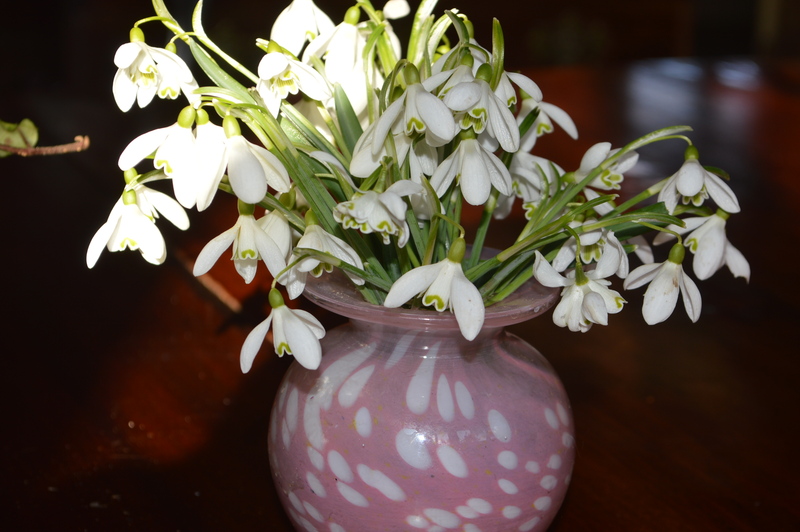 Snowdrops are the flower of the moment, they are a joy. Thank you Amanda, I am glad you like it, I’m off to see yours now. I am looking forward to seeing your greenhouse, it sounds wonderful. I shall try and do a greenhouse post early next week. I’m very partial to the version with the aconites. 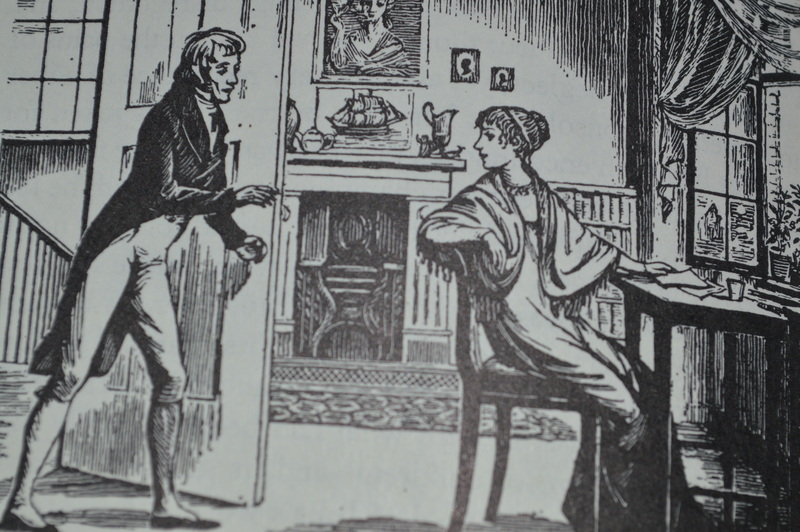 Jane Austin’s heroines all have something irritating about them – Emma, for example. Not to say I don’t enjoy the books though! Emma is scheming and manipulative and a terrible snob isn’t she. Like you, I love the books though. No, not all my specials, just this year’s purchases. Fanny is a new one bought at my garden group meeting recently. I shall probably plant them out but in the past some specials have disappeared in the garden. And others have lost their labels. I have a notebook with the exact name and position of each snowdrop but I have misplaced it. Still I think I have identified and relabelled most of them. I prefer this Fanny to Jane Austin’s too. I found Emma irritating too – I’d probably pick Elizabeth Bennett or Anne from Persuasion for a more likeable heroine. Do you have either of them in snowdrop form? Would love to take a look around your greenhouse! I don’t like Emma either. Still I love all the books. No, I have no Elizabeths or Annes. 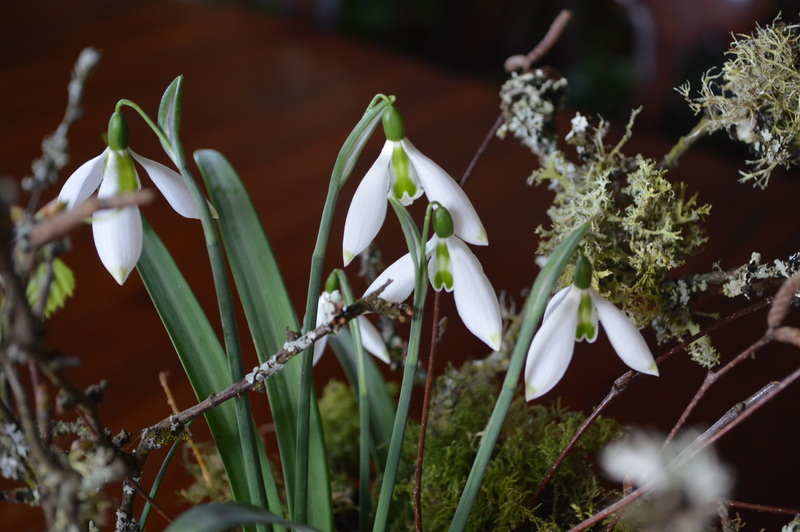 I shall show you some more of my snowdrops in my next post, coming soon. And next week I shall give you a tour if the greenhouse. A splendid idea to enjoy ‘Fanny’ in an arrangement without cutting her and you’ve carried it out very well. Our snowdrops are currently covered in a foot and a half of snow. 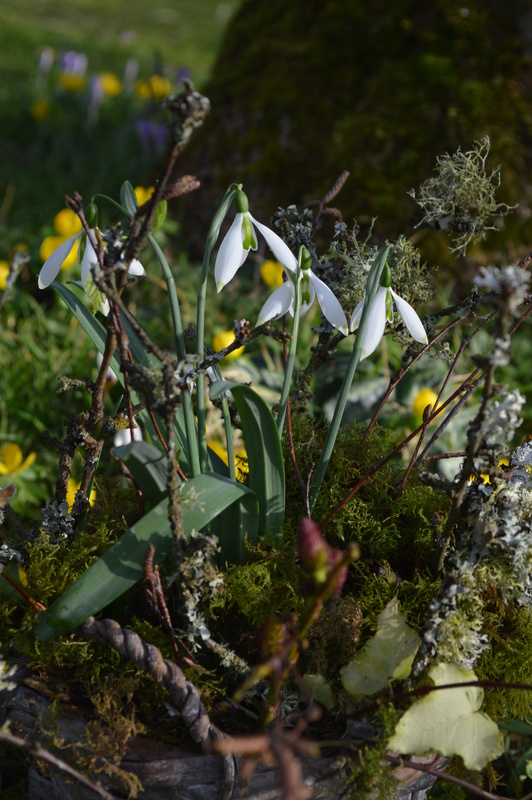 Yes, I can’t bear to pick any of my specials, specially as I have carpets of Galanthus nivalis to pick. A foot and a half of snow? Oh Peter how awful, what a good thing you have your lovely green house to enjoy. Its always a bit of a game finding the ideal place to put an arrangement to photograph. I enjoyed reading about your staging of your growing snowdrops. I am just starting on my journey of growing special snowdrops, and have not wanted to pick any of them. They are in the garden so no possibility of dressing them up. The moss and lichen really set up the blooms and their foliage beaurtifully. It’s a shame to pick specials as you want them to seed around and spread. And of course there is always the chance that you might get an exciting new seedling. Thank you Kris. Just wait till my next post, you’ll find plenty of snowdrop adoration there, too much probably. Fanny is lovely, sometimes the variations in the Snowdrops escape me – I love this one. Slender and tasteful is Fanny. The basket is the perfect display and I love lichens. Looking forward to the Snowdrop and greenhouse tour. Thank you Amy. 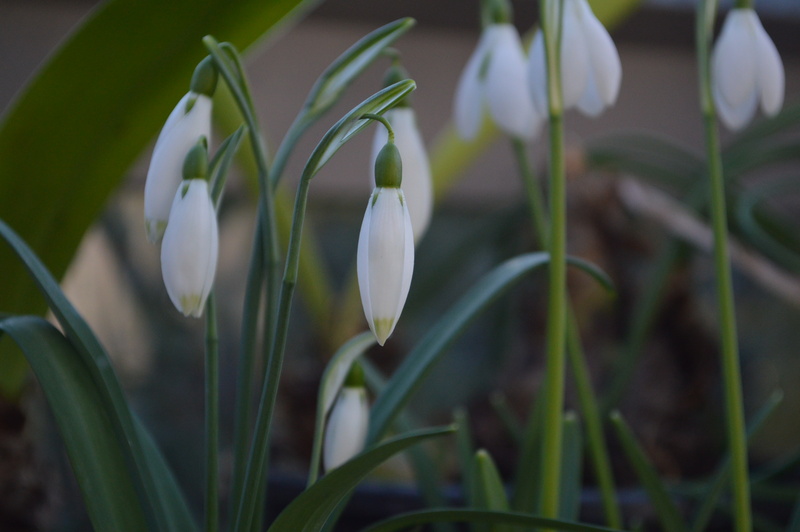 I suppose snowdrops are a bit alien to you but they light up the February garden. Oh thank you Dina, those are kind words coming from an artist. Fanny make a wonderful snowdrop. Tucking the pot into natural materials made a great presentation. Were I close by I would love to receive some passalongs from your garden. Have a great week! That would be fun Susie. And I would be begging pieces of your lovely irises. She is lovely isn’t she? I haven’t had her very long so I don’t know how vigorous she is. Any chance of a post about your snowdrops? I’d love to see them. 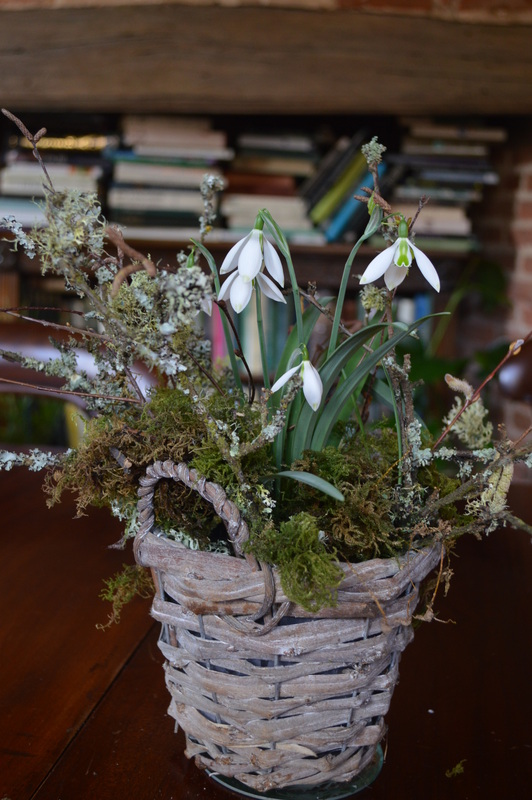 I agree, I always have a bunch of snowdrops on the table in February. Oh yes, I understand you so well and think this is the best way to display them. I find it so hard to cut flowers in the garden unless I really have lots and lots of them. Fanny is a beauty but aren’t all snowdrops gorgeous. I look forward to the greenhouse too! I agree unless you have carpets of flowers cutting them can create gaps. Still it is nice to have them in the house. I hope you are enjoying some nice spring weather, it has been lovely here today. 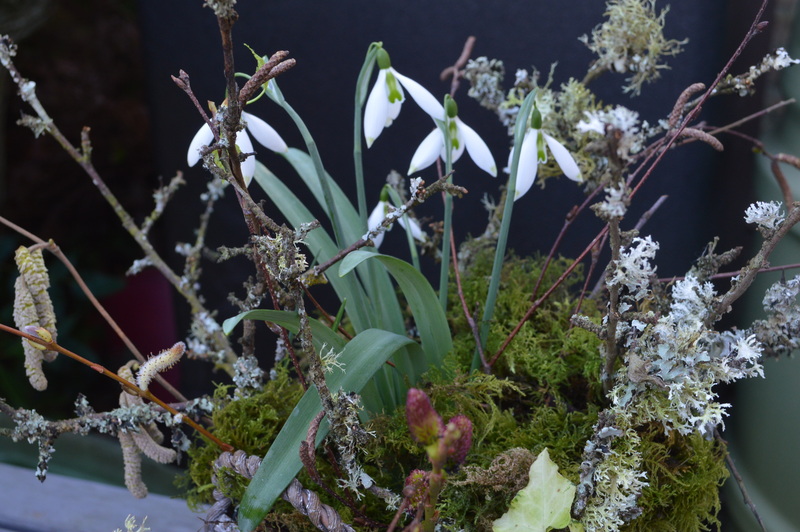 How I wish I could take you up on your snowdrop offer now I have a cold winter garden! At least I’ve identified where I mean to plant my winter bulbs as soon as possible. I love book talk too, I’ve often thought about having a book blog but I don’t think I have the time. I know Jane Austen loved and admired Fanny and I have struggled to understand why. She was shy and poor but that doesn’t make her worthy. We are supposed to believe she had a strong moral code and she did, but I found her moral superiority when the others were having fun with the play was irritating. And much of her disapproval with Maria was based on jealousy. Anyway she got her Edward in the end and good luck to her, I should think he would be a frightful bore. And they were cousins which is a bit dodgy. I love the way JA’s characters are so real and so human. I love that you have us talking about books and plants in just one blog post Chloris. I like the way you talked us through the dilemma of how and where to share Fanny with us and the problems of where best to photograph. Outside is always tricky. A blank backdrop is best if not always easy to find. Books and plants are my two great loves Dorris, it is always fun to combine the two. 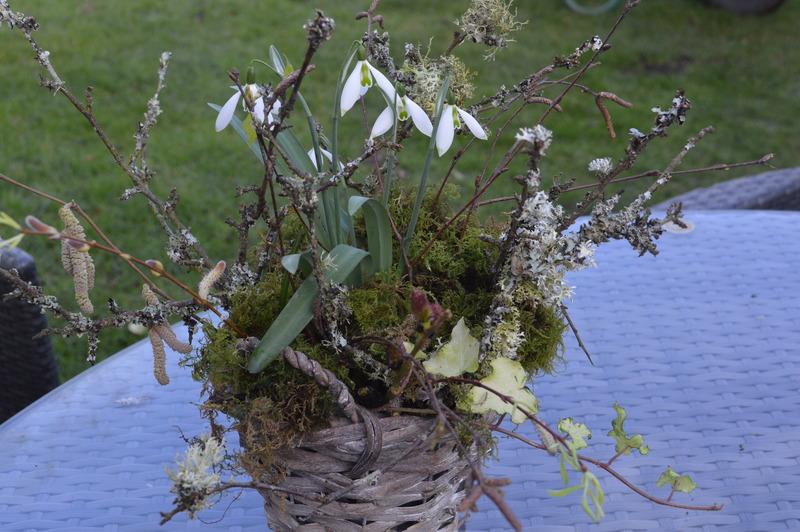 Very nice – never thought of using Snowdrops as a cut flower. I actually like the last vase too, even though it is simple. I used to do that with the paperwhites back when there were so many of them. They looked lovely to me in every location!